Step one: See below for current volunteering opportunities, this is where help is needed most. Step two: It’s great if you can visit the project to get more of an idea about what is involved. Get in contact with us (0191 3037559) to arrange a visit. Step three: We will send you our application form and arrange training. If you can’t commit to a regular volunteering role (we know life gets busy!) there are extra one-off volunteering opportunities around Harvest and Christmas, so keep and eye out for those. We have been really pleased to welcome staff teams from local business and organisations for volunteering days at our foodstore in Chester le Street. If your business would like to volunteer with us please get in touch. We are currently looking for volunteers to help at our Laurel Avenue, Peterlee, Newton Aycliffe and Esh Winning foodbanks. We are looking for people to help distribute food to people who are in crisis situations. Distribution volunteers meet and listen to people who come to the foodbank with a voucher to get food. If possible we point people to relevant agencies or sources of support, aid or advice. Some volunteers do more of the “front of house” role; chatting to foodbank users. Other volunteers do more of the “behind the scenes” tasks, packing the bags and keeping the stock of food organised. 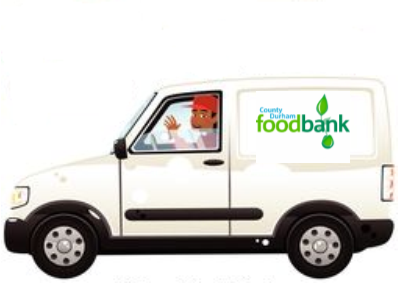 Our volunteer van drivers are a crucial cog in the foodbank machine! Driving the foodbank’s own van, they deliver food to our food distribution points around the County and keep the foodbank going! They also pick up collections of food from our supporters such as schools and offices. Mostly during Monday – Friday, between the hours of 9am and 5pm. The van is collected by volunteers from our foodstore in Chester le Street. Exact times are agreed between volunteers and the Food Supply Manager to suit needs and availability. We also looking for drivers to pick up collections in their own cars as mentioned above – we are especially looking for volunteers during September to December as this is our busiest time of the year for collections. Help Once the vouchers are redeemed the data they contain needs to be added to our central database. Full training and support is available.